SLP Felicia Conlan (far left) protesting during the strike along with her fellow teachers and students. No one really walks in LA, and we usually stay indoors when it rains. So heads turned when tens of thousands took to the streets all over the city. We chanted with our colleagues, jammed the subways wearing red for education, and made signs with messages demanding funds for schools. Our cause? To get the Los Angeles United School District (LAUSD) to invest in our students, improve school safety, lower class sizes, cap charter school expansion, and provide a fair contract and wage. We were loud verbally and nonverbally. Speech-language pathologists like me joined the picket lines and marched alongside educators despite the pouring rain. The LA teachers union also represents us. Our district considers SLPs to be itinerant related service providers, a category that includes occupational therapists, psychologists, physical therapists, and others who serve diverse, complex caseloads in several schools. It was a difficult week physically, mentally and emotionally. We raised our voices and our signs for students in preschool through high school. During the week-long strike we got to know our colleagues better and met people in the community who joined us in picket lines, donated food and beverages, and even opened up their homes. Every honk of support, every wave, every hug, every text of encouragement, every weary smile meant something. As ugly as the strike sometimes felt, human kindness and consideration ruled. After the respite of a holiday weekend, we marched again early Tuesday morning and made our way downtown for a huge rally. Union representatives and the school district, with the help of the city mayor, negotiated throughout the weekend. By day six of the strike, negotiators reached a temporary agreement, which a majority of union members ratified. Mixed reviews resulted, but the strike was officially over and I went back to work on Wednesday along with everyone else. 1. True decision-making happens at the bargaining table. If we want change, SLPs have to be where decision-makers meet. If we want to open eyes about our profession, we must make our needs known alongside our education colleagues. 2. Advocacy comes in many forms. For many of us, this was a first experience in demonstrating civil disobedience. Usually SLPs go with the flow and get along easily with others. We are collaborators. When the strike started, even those initially reluctant took part as a member of the union. Unified by the cause, we visibly showed our support by joining the picket lines. We wore signs and chanted demands promising to “stand up, fight back.” Our school colleagues, administrators, union leaders, parents and others took notice. Students and their families also joined us on the picket lines and strengthened our cause. 3. Leadership and advocacy training is needed. For SLPs to make a stand at the bargaining table, we need leadership skills and advocacy training or experience and encouragement. We advocate so well for our students. We can turn that skill into the courage to speak up for better working conditions, salaries, benefits, and resources, and for our profession on a long-term basis. 4. Branding and public perceptions matter. Another chant: “People want to know… who we are… so we tell them.” Are we speech-language pathologists, speech therapists, or speech teachers? The public doesn’t usually know these are one and the same. Our professional title is speech-language pathologist and we should use it consistently. With the public eye on strikes around the country, it’s the perfect time to tell people who SLPs are and what we do. Social media is a powerful tool to get the word out and images speak loudly. 5. There are several versions of the truth. Does the children’s game “telephone” ring a bell? When you receive information, before spreading it, remember what they say, what you say, what you think you heard, and then what someone says you said. Half-truths and speculation can damage the cause. So find a reliable source. If you are the source, communicate well and often. 6. Building relationships builds trust. A strike provides an opportunity to get to know teachers and other colleagues better. I formed bonds beyond sharing information and experiences. And you never know what resources or personal networks can help the cause or your professional development. Collaboration and sharing resources expands everyone’s potential. 7. Encourage and support can go a long way. Check on friends and colleagues. Start a text stream to update one another with reliable information. My school representative sent us information right away and offered words of encouragement each day. 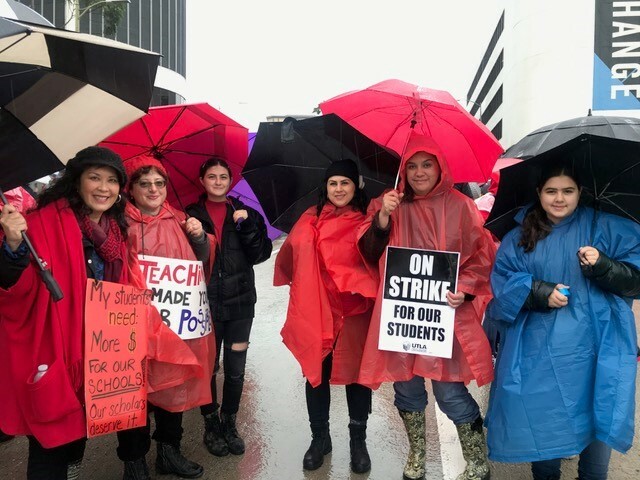 A private Facebook group started by a colleague for LAUSD SLPs kept us feeling connected during the strike. SLPs often feel isolated during the school year, so it helped to connect virtually with peers. 8. A little kindness goes a long way. Feel free to talk to an administrator before or during the strike. The strike is difficult for both sides. We all want what’s best for the students. Your voice can provide support, cause others to consider another option, or be destructive. It’s okay to have a different opinion, but think through what you say and to whom you say it. 9. Self-care is crucial. The strike wears you out. Eat well, take your vitamins and get a good night’s sleep. People will kindly offer so many carbs and sweets! Practice good vocal hygiene when you chant or shout. Feel free to share your SLP knowledge on voice care with teachers, too. 10. Dress comfortably and prepare for weather. Before you walk out the door, think about the weather. Do you have rain boots, an umbrella, poncho, walking shoes, sunscreen or sunglasses? What public transportation can you use and do you need to organize travel in advance? Find a nearby bathroom—you can’t go inside the school. Luckily, a retired teacher across the street offered his home for us to use. Pack snacks, patience and a sense of humor for however long the strike lasts. Wear layers and #RedforEd. The day after the strike ended, the sun shone and blue skies brought a positive energy. “Welcome back” signs assured us we were missed. Treats and the smiles, hugs, and notes from the kids filled our hearts. This strike was for our students, communities and public education. Despite our exhaustion and grumblings of what more should have been included in this new contract, we move forward, and find a new normal. Nice to read this perspective. Parents want the best for their kids. Our teachers and SLP’s are LAUSD’s intangible assets and should be treated well. “No one really walks in LA”?! Nothing could be further from the truth! What do you think those of us who use the subway on a daily basis do once we get off? Well said Dr. Conlan; it was the first time to experience a historical movement that left a positive impact on us!